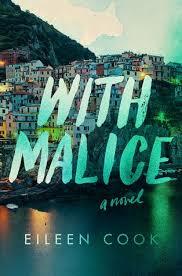 Many, many moons ago I read and reviewed With Malice by Eileen Cook. I loved every single second of it. Sadly the book isn’t out yet. Even though I’ve read I really can’t wait for it to release and I’m so excited to see what other people will think of it. Synopsis from Goodreads.com: Eighteen-year-old Jill Charron wakes up in a hospital room, leg in a cast, stitches in her face and a big blank canvas where the last 6 weeks should be. She comes to discover she was involved in a fatal accident while on a school trip in Italy three days previous but was jetted home by her affluent father in order to receive quality care. Care that includes a lawyer. And a press team. Because maybe the accident…wasn’t an accident. Wondering not just what happened but what she did, Jill tries to piece together the events of the past six weeks before she loses her thin hold on her once-perfect life.